DO I NEED PLANNING PERMISSION FOR FENCES, GATES AND GARDEN WALLS? Erecting a fence, gate or garden wall can transform your garden into a distinctive space to relax and enjoy your space. It can also serve to protect your property, by acting as a security barrier between the street and your home. 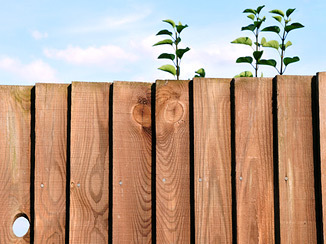 A new fence or wall can breath new life into the appearance of your property and really give it a well maintained look. Whatever your reasons of putting up a fence, even if its just to keep out the neighbours dog, it is important that you are aware of the relevant planning restrictions. Fences, Gates and Garden Walls Not Requiring Planning Permission. You will not need to apply for planning permission to take down a fence, wall,or gate, or to alter, maintain or improve an existing fence, wall or gate (no matter how high) so long as there is no increase in its height. However, if your property is in a conservation area you may need conservation area consent to take down a fence, wall or gate; regardless of whether you will replace it with a new one. the fence, wall or gate, or any other boundary involved, does not form a boundary with a neighbouring listed building or its grounds. If your property is in a conservation area you may need conservation area consent to take down a fence, wall or gate, regardless of whether you will be replacing it or not. We urge you to contact your local authority prior to carrying out any works in a conservation area. Failure to adhere to the relevant regulations can result in a lengthy and costly legal battle with the local authority. You will not normally require planning permission for hedges. However, if a planning condition restricts planting in your area or your property you may need planning permission and/or other consent. It is advisable to contact your local authority before planting any hedges as you may be served notice to have them removed if any restrictions do apply. If you are planning on erecting a fence, gate, or garden wall you will need to obtain fence, gates, and garden wall planning permission. When obtaining this permission, it is important that the infrastructures that are being erected fit the guidelines that have been set in place by the planning committee. These guidelines state that the infrastructure cannot be over one metre high if it is located next to a highway that vehicles commonly utilize. If the infrastructure is not located next to a highway, it cannot exceed two metres in height. The right for you to erect or alter any fences, walls, or gates has been removed by the planning conditions. However, even though you have to apply for planning permission in order to erect one of these infrastructures, you do not have to apply for planning permission if you are going to be taking down a fence, wall or gate, or altering it to improve it in some manner. But, if the improvements are going to require you to increase the height of the infrastructure than you may need to get planning permission for this type of alteration. Do I need planning permission for fences, gates, and garden walls is both a yes and no question. You will need permission when adding an infrastructure, but when removing it or perfecting it you will not, just as long as the height of the infrastructure remains constant.